Kicked off by Sundance New Frontiers and with the looming release of consumer kits (if they stick with the 2015 release date), I think it’s safe to say we are in the year of VR. 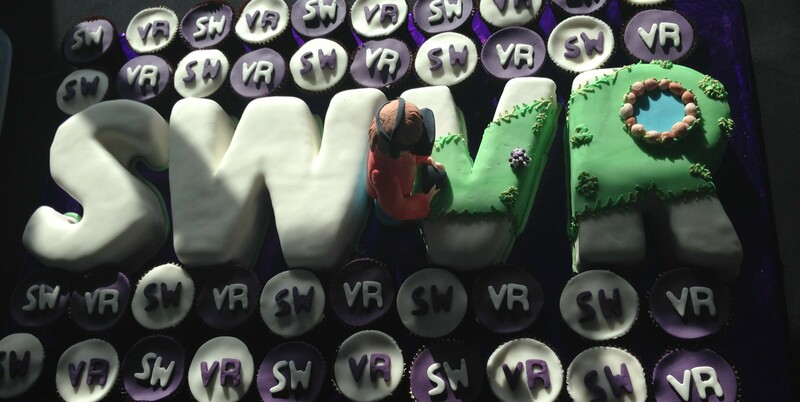 This has not gone unnoticed in Bristol, where indie games studio Opposable Games organised South West VR; a conference dedicated to the exploding platform. Whilst the focus was games, the majority of the speakers discussed the change in narrative structure, the new affordances that were on offer and the challenges of directing user behaviour. Something that really stuck with me from the day was the realisation that this early open access to new technology hasn’t happened in a lot of people’s life times. Now creators of games, non-fiction, films and more have access to a platform that is experiential, immersive and empathy-inducing. Games designer’s Ana Ribera and Katie Goode both spoke of the challenges of getting your audience to really interact with VR when we’re so used to just sitting and consuming media. – People don’t always know to turn their heads once in a VR world – create a bland, relaxing setting to slowly introduce people to the environment and its affordances. – Add elements to an experience that encourage exploration. – Reward the exploration when it happens. For every piece of tech that comes along, we try and use old language to create work. Nick Pittom (Fire Panda) highlighted that whilst we can take lessons from film, theatre and games – we must recognise VR is a new medium and we need new ideas. Whilst you can point your audience through a narrative, the direction is driven by the viewer – they may not look where you want and they may not behave in the way you expect. Design the whole experience. Ana spoke of the difficulties of sharing VR work when the platform exists within conference and demos – not in the hands of the general public. One option is to release experiences through Google Cardboard, which is currently far more accessible – but doesn’t really provide a fully immersive experience. You also need to expand to people who are outside the demo circuit – those who haven’t tried VR and don’t know what to expect. You need to cross people’s boundaries and make them want to try. Mark Washbrook and Paul Colls (Fierce Kaiju) recognised the the potential of VR to reach audiences that games haven’t been able too. The opportunities within gaming to touch a wider variety of topics extends to non-fiction work as well – we are just at the beginning of exploring the possibilities. Think about experiences in VR – passive things still work. Not everything has to be complex in its design. Alongside the games and experiences and experiences being showcased, there was also some new tech being demonstrated. Ultrahaptics was founded in 2013 based on technology originally developed at the University of Bristol, UK. The company secured Seed Funding in 2014 to allow for the further development of the technology and the expansion of the engineering team. Ultrahaptics is currently engaged with tier 1 customers, from multiple markets, with their recently launched Evaluation Program. The WizDish is looking to solve the problem of movement in virtual reality by providing a platform that allows you to “walk” around the environment without walking into a wall. Although I was initially unconvinced after watching other people have a go – they looked unnatural and awkward – once I was in the dish and playing a virtual game of Pacman, it added to the experience hugely and to my surprise, felt almost immediately natural. immersiv.ly is a multi-platform app to showcase news reports and features produced in virtual reality and 360-degree video. Check out Edward Miller from immersiv.ly’s talk: Will VR be the future of broadcast television? You can see more of the talks, plus interviews with the speakers here.